French fashion may be mysterious and masterful, but it's not entirely unattainable. The women of this highly chic country are forever at the top of the tree when it comes to effortlessness—no other nation could possibly contend for the title. But as well as adopting their relaxed attitude to getting dressed, there are style cues you can take and tweak to incorporate into your own wardrobe and bring in un petit peu of that coveted je ne sais quoi. It's highly likely you know some major French fashion rules by heart already: For example, brushing your hair is a sacrilegious act, one should never scrimp on the day-to-day pillars of a closet and everything is best worn thrown together to encourage the perception that you've probably had a really wild time the night before. French girls are having fun and living life to the fullest—or at least that's what their outfits tell us—but there are other, more nuanced factors that play into a Gallic woman's wardrobe as a whole. And that's where we step in. So enrol in our French style school, where you'll learn everything from the grade-one basics through seriously advanced stages of being super chic. Get scrolling to see and shop the French-fashion guidance. #1: Your ultimate style icon is your mother. And yes, it's a totally normal—nay, brilliant—thing to dress similarly or even in the same outfit as your maman. Great style and wardrobe classics never fade, so why can't you wear them now and in four decades' time? It girl Jeanne Damas proved the point recently, snapping herself alongside her mother, both wearing the same blue ribbed tee (from her collection on Rouje) and high-waisted jeans. #2: Whenever possible, bare your legs. Maybe all French girls are blessed with excellent pins like Ellie from Slip Into Style, or perhaps they just know exactly how to play out a slashed-to-there hemline and not look overdone. We love the flirty, casual ratio of a marl tee and flats with a revealing skirt. #3: Only wear heels that you can walk in. As any well put-together French maven will tell you, there's nothing less attractive than hobbling around in high heels. It's all about looking cool and breezy. It's no wonder many French girls (like influencer Anne-Laure Mais of Adenorah) turn to classic brands for classic pieces. For example, Karl Lagerfeld never produces sky-high stilettos at Chanel—just clever ones like the toe-cap mules you can slip on and off and last in all day. Anne-Laure's simple two-strap sandals are actually from her own brand, Musier Paris. #4: Tailoring is the source of all greatness. No self-respecting French girl would consider their wardrobe complete without a blazer (or 10). They are the beautifully tailored glue that holds all looks together. #5: Subtly define your waist at all times. We're not talking about waist-cinching of the extreme variety, but French women always make sure that their figure is in some way in check—even when wearing loose-fitting clothes. Blogger Aria Di Bari has is just right here with her belted tunic over wide-leg trousers. So chic, uh. #6: Never be afraid of wearing something flirty. Anne-Laure Mais has a similar approach to Carine Roitfeld when it comes to sultry dressing: It's all about a 50/50 ratio. Yes, you can see she's wearing a bodiced black dress with a thigh slit (with no bra, in true Français fashion), but the rest of her look is dishevelled and relaxed. Walking this line successfully? It's all down to confidence. #7: Always invest in great outerwear. From biker jackets to boho suede coats, bombers to blazers, French girls invest a heavy amount of cash into great outerwear. It means that your simple jeans, tees and shirts never have to work hard since the cover-up does all the talking for you. Let's face it: In our climate, you'll get the wear out of a well-chosen piece. In a similar vein to the sassy/sensible ratio we mentioned earlier, there are French fashion rules that apply to the level of accessorising set against an outfit. Want to wear your new shoes, bag and hat at the same time? Then you'll need a clean, simple, super-plain outfit underneath—preferably in a neutral colour. From espadrilles to beachy cotton tops, it's completely acceptable to bring a little seaside style to your city look en France. #10: Be nonchalant at all times. Even when wearing a beret and standing in a ball pool, French girls will still maintain a level of nonchalance. This wrap style suits every figure under the sun. French girls are now wearing party shoes in a more laid-back way during the daytime. A new part of the French-girl fashion kit. French girls are at the forefront of the belted-jacket trend. Every Parisian girl we know has a smart mini in her wardrobe. 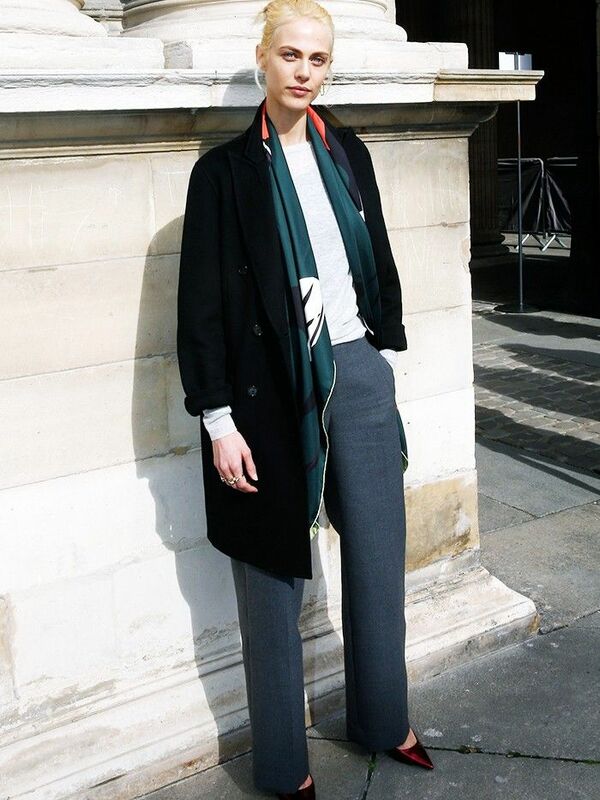 The coat style that's really taken off in Paris this winter. All the French girls on Insta just love a pair of brown suede boots. Best worn with seriously messy hair. These bags are selling like hot cakes. Now that you've got Gallic-girl style down, see the new wave of French labels you probably haven't heard of yet.